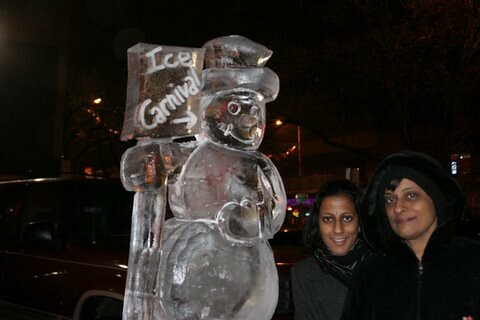 They had a lovely Ice Carnival and it was that day that there was also a frost, and that added beauty to the Carnival. kalyan sent me this link…I really don’t know whether to laugh at the greed, or cry at the death…. 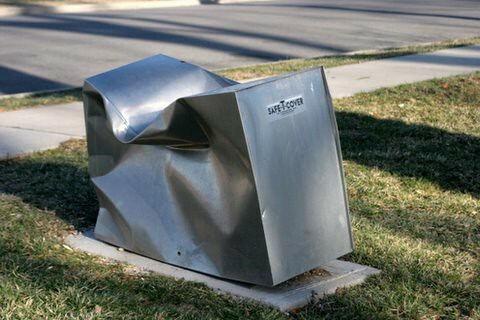 What happens to a “safe cover”? And lastly…I first approached this, thinking that it was, possibly, another avant-garde sculpture in Forest Park! High Intelligence+Youth+Sometimes Good Looks=Very Often, Arrogance+Ageism. …so, if you haven’t yet, do watch “An Inconvenient Truth” , a documentary on global warming, presented by Al Gore. It’s a scary documentary, no matter what he says about there being a message of hope. And if you want to be right royally depressed, read The Inheritance of Loss by Kiran Desai, the Man Booker Prize winner. A bald visitor to the Sambandhi’s home….. 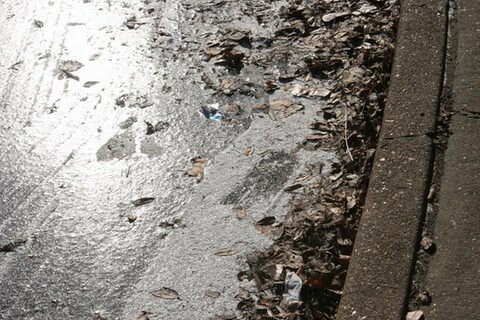 I posted about how I missed the first Bald Eagle event (Jan 14th) at Old Chain of Rocks Bridge, St Louis, when it got cancelled due to the ice storm. 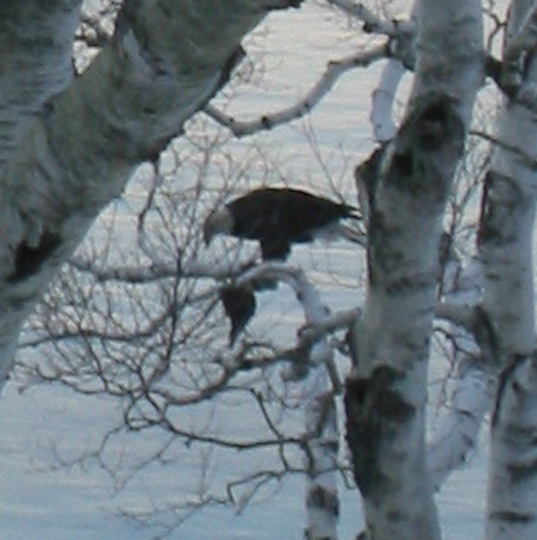 I then waited eagerly for a week, and we went to Alton, Illinois, on Jan 22nd to see the eagles in their riverine habitat. We had to stand about mile away to see them, standing in the freezing cold, turning an enraptured blue…. 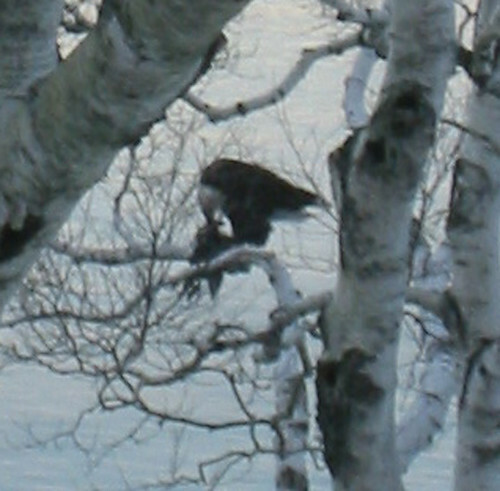 A bald eagle had caught a duck, and was sitting in the birches on the edge of her front lawn, eating it! The eagle stops to look directly into the lens…with the kind of vision it has, the bird probably took in every detail of LS’ home, camera, even the number of her eyelashes (eagles would be able to read fine newsprint across the length of a football field)…. And the meal then proceeds…. I sat at those same windows in that house for 4 days…of course the bald eagle did not visit until de Ponti Murphy left and had taken a lot of trouble to see its brothers and sisters elsewhere! I will never again be able to look at a stamp collection without thinking of Peat Bog Awareness! 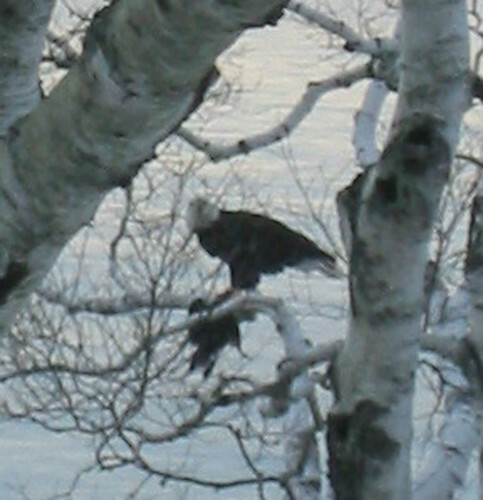 Gosh, this jet lag means no sleep at the “right” times…so I decided to post the bald eagle photos before going off for my walk…Photos by KM. The camera had a lot of trouble midway through and we were lucky to get any pics at all. We went to Alton and before we were taken to the eagle habitat by bus, we went to see a captive bald eagle on the hand of his trainer, at the Visitors’ Center. 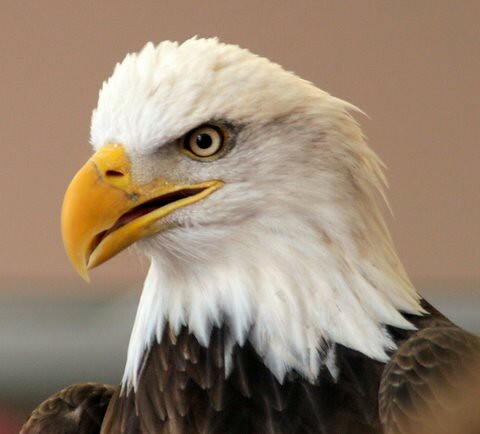 Here he is, McGuire the bald eagle, in all his majesty…he is named after the famous baseball player. He lives in Milwaukee. You are currently browsing the Deponti to the world blog archives for January, 2007.